"Great Care - Smells Good!" Our fifth televison commerical is our first just plain FUN commercial! Did you hear the one about a man and a dog in a bar? One Windmill client says he likes the Windmill because It Smells Good Too, but a Windmill patient says he likes Windmill because he gets the Absolutely Great Pet Care...and the argument is on! Great Care - Smells Good! Dale Robertson, who just happened to be Windmill's first client, continues to be our "actor" for our commercials. Dale has turned into somewhat of a local celebrity with his humorous renditions of "And it smells good too"! Luther Rippy (a client of Dale's) capably played "Windy" the dog. 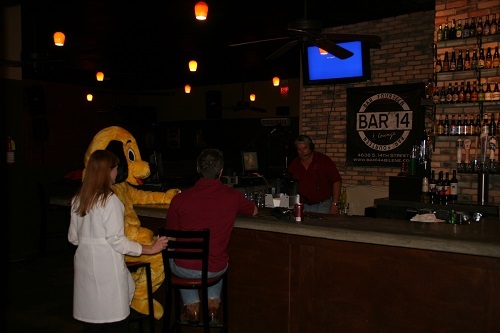 The commercial was filmed at one of our favorite watering holes, Bar 14, located at 4638 South 14th Street. Visit them at www.Bar14Abilene.com. Thank You Calvin and Keely (owners of Bar 14)! The commercial is photographed and edited by Walter and Amy Wiggins of Green Turtle Photography. Thank you Amy and Walter for your patience! Thank you Dale, Luther, Calvin and Keely, for your generous assistance with our fifth commercial! Dale and his wife Jill are personal trainers, and own and operate Quantum Excellence Training here in Abilene. They are highly recommended!